The rear stacker is equipped with rails made of form bent special steel. The lift cylinder is double acting with lowering speed control. The tilt cylinder with a check valve comes as standard, as well as connecting hoses with quick couplings and round bale spikes. The max. Payload is 1000 kg. The lifting height is 400cm. 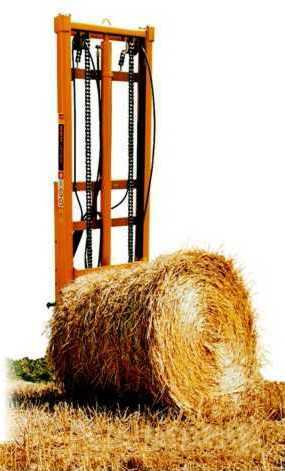 The stacker can be tilted up to 12 °. The weight is 380 kg. A special version of pallet forks can be delivered for 220,00 Euro. Also a PTO with oil pump, tank, connecting hoses can be supplied for 1030,00 Euro.